The Patio is reopening sometime later this year, thanks to Demetri & his father's hard work. They'll need everyones support to keep her afloat, and we can't wait to have the theatre back. Help them spread the word. Become a fan today! Be sure to go to the Patio Theatre Fan Page and become a fan. Enjoy an evening at the movies under twinkling stars and moving clouds. In an open space of 1500 seating capacity. The largest single screen in Chicagoland. A state of the art sound system featuring Dolby SR and JBL speakers. A grand neo-Pompeian lobby restored to original elegance. 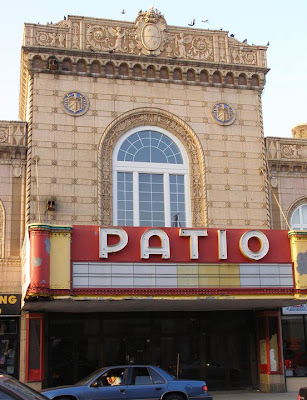 The Patio Theater located on the Chicago’s northwest side is the only movie palace of the bygone era still in service to the community. Lovingly restored and decorated in the grand tradition complete with all the elements that make a night at the movie a memorable experience for the whole family to enjoy. Come and see your favorite movies at popular prices ($5.00 per person) on one giant screen under a simulated blue sky, flickering stars and moving clouds.